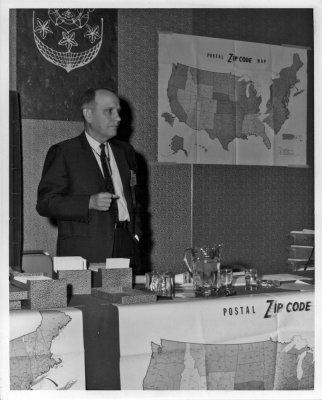 Did you know the ZIP code was invented by an Air Force veteran? In the rise of today’s digital world where you can buy almost anything and have it delivered by the next day, it’s hard to believe there was a time when mail functioned without a ZIP code. With the loss of many employees from World War II and mail circulation on the rise, the U.S. Post Office was searching for ways to manage the exponentially increasing mail volume. After serving in the Air Force from 1942 to 1946, Henry Bentley Hahn, Sr., became a postal inspector for the U.S. Post Office Department. Six years later, Hahn developed a solution to the growing mail problems with the idea of a “Zone Improvement Plan,” establishing the ZIP Code and the two-letter state abbreviations. The final plan was announced to the public on November 28, 1962 and implemented on July 1, 1963. Learn more about the ZIP code implementation and check out the fully digitized H. Bentley Hahn Personal Papers now available to view from the JFK Library.